Please fill this form to contact us and we'll get back to you immediately. 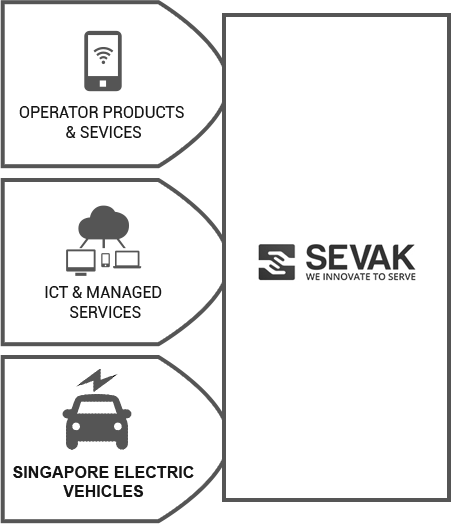 SEVAK Limited was incorporated in Singapore under the name of Mediacom Technologies Pte Ltd on 15 July 1993. Subsequently, it was converted to a public limited company on 25 October 1999. The Company has also embarked upon Battery Electric Vehicles fleet management services in Singapore since 2016. In Indonesia, the Company mainly distributes mobile prepaid cards as authorized distributor of the well-established telecom operators in Indonesia namely PT Telekomunikasi Selular (Telkomsel), PT XL Axiata, and PT Indosat (“Airtime Business”). The distribution is based on a network of more than 30,000 resellers, 150 dealers and sub-dealers, along with a network of large number of branch offices and sub-branch offices in Indonesia. Based on partnerships with global players like IBM and HP, the Company provides both hardware infrastructure and business service integration for governments and corporate clients in Southeast Asia. The Company offers integrated one-stop ICT solutions ranging from consultancy to maintenance and disaster recovery services and also undertakes projects on Networking, Data Hosting, and Managed Service solutions. The Company is now focusing on services driven business and key innovative offerings aligned to IBM and HP strategy to improve margins via futuristic services based Offerings like Cloud, IOT, Server consolidation, Virtualization and other services relevant to a developed. The Company is moving from “Information to Innovation” in the coming years and has started exploring new areas of opportunities in ICT and Electric Vehicles since 2016 onwards. In a strategic move to focus on innovative technologies, as the information technologies may not have the desired growth potential, the Company is embarking upon an innovation led business of battery electric vehicles (BEV) with a Chinese manufacturer BYD (Build Your Dreams) in Singapore. Since 1999 SEVAK Limited is listed on the Main board of the Singapore Exchange Securities Trading Limited and operates under the ticker symbol SGX: BAI.